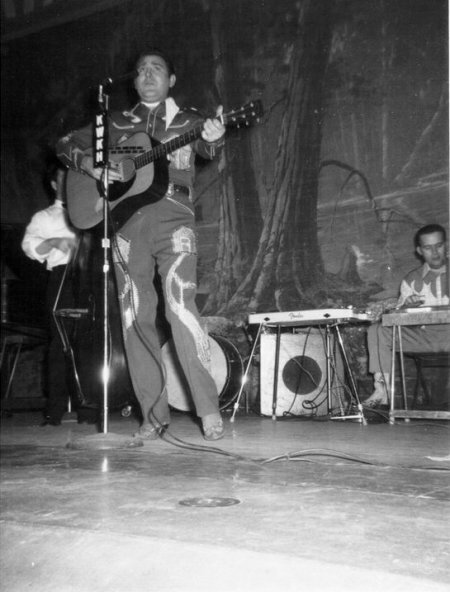 Elvis Presley, our homegrown hillbilly singer, is continuing his swift, steady stride toward national prominence in the rural rhythm field. 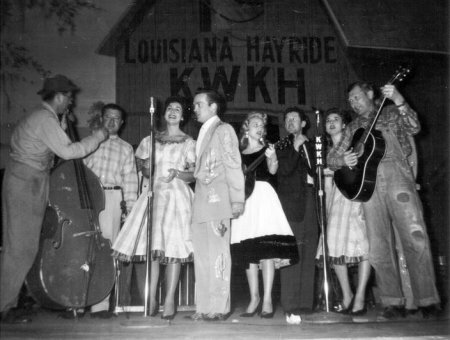 Latest honor to come his way is as guest performer with the Louisiana Hayride, to be broadcast Saturday night over KWKH, Shreveport. 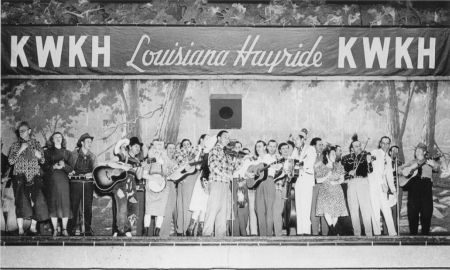 Louisiana Hayride is about the second or third most popular hillbilly program on the air. 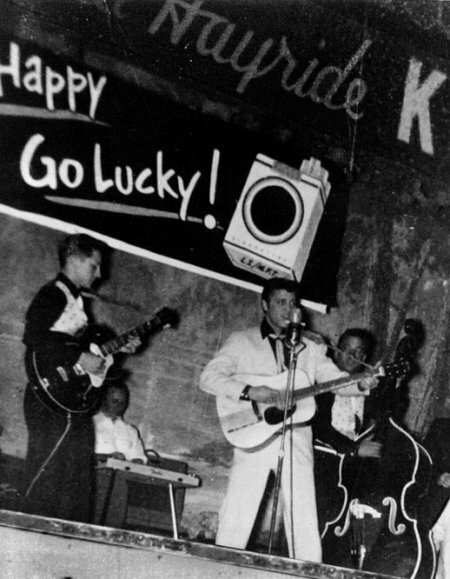 The tops is Nashville's Grand Ole Opry, which never takes anyone but long established stars in the country music field. 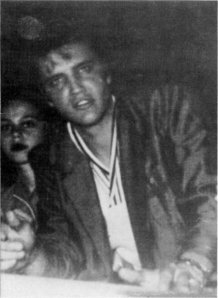 But Presley has already appeared on Grand Ole Opry - on Oct. 2 - and neither customer nor fellow performers wanted him to quit. 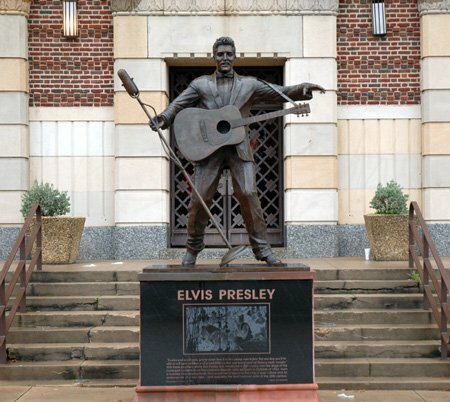 It is unprecedented for Grand Ole Opry to take a performer on the basis of a single records, which is what Presley had until two weeks ago. 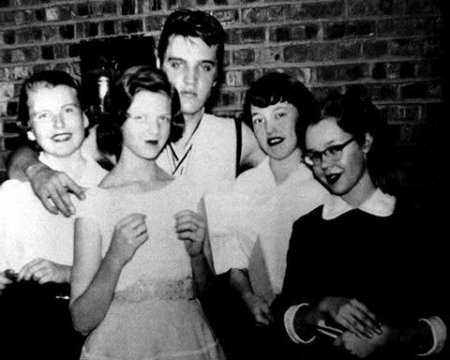 Presley, 19, is the son of Mr. and Mrs. Vernon Presley, 462 Alabama, and was graduated from Humes High School in June, 1953. 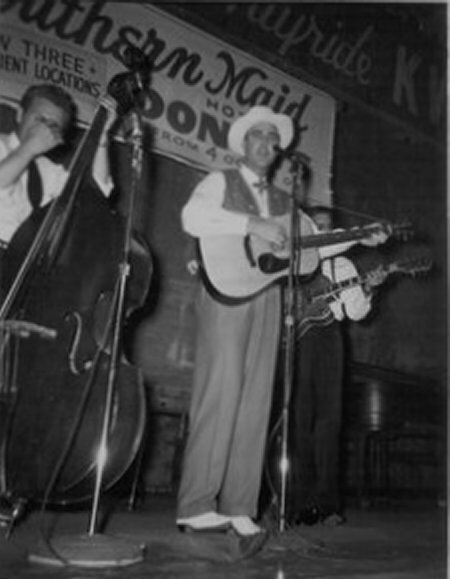 His first record release, for Sun Record Co. of Memphis, backed "Blue Moon of Kentucky" with "That's All Right," and sold a sturdy 6,300 discs in Memphis in less than three weeks. 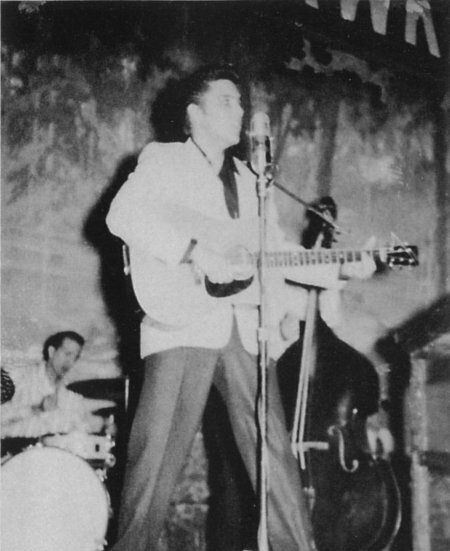 His second record, released two weeks ago Monday in the Memphis market alone, has already logged an astonishing 4,000 copies of "I Don't Care If The Sun Don't Shine" and Good Rockin' Tonight." 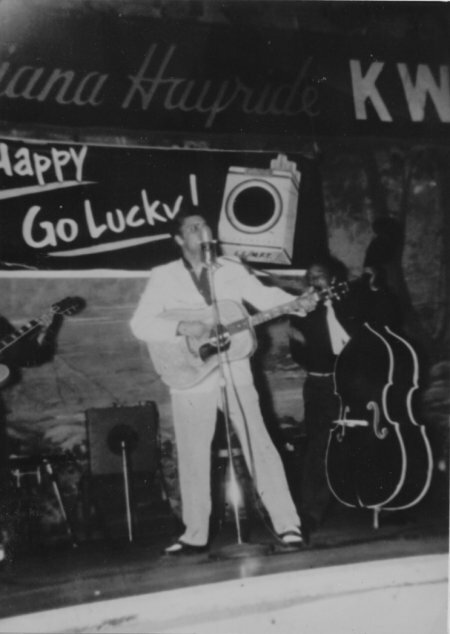 National distribution is expected to get the Presley name and fame really booming. 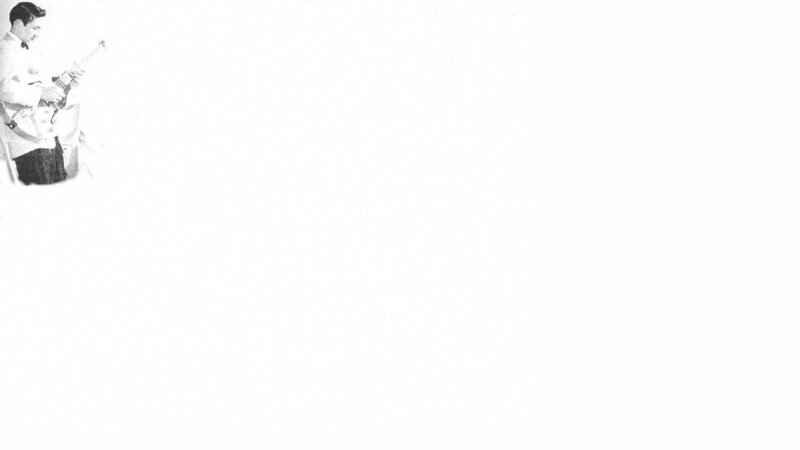 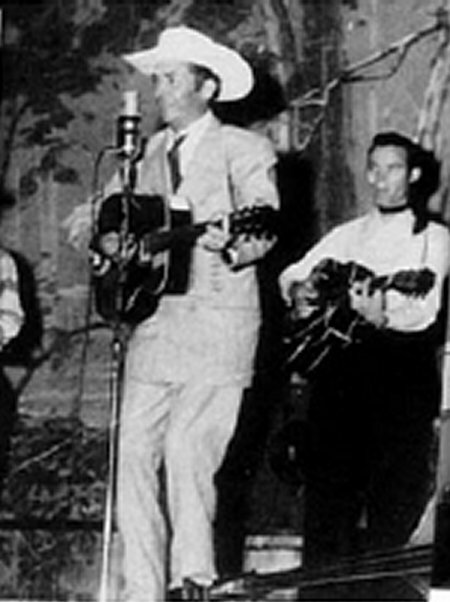 The following month, Bill Sachs in Billboard noted that Country music was exceeding pop music and becoming the "biggest thing in entertainment". 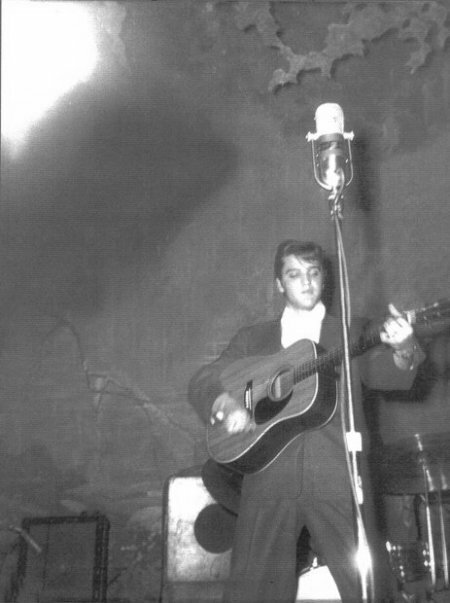 In the same piece he wrote, . 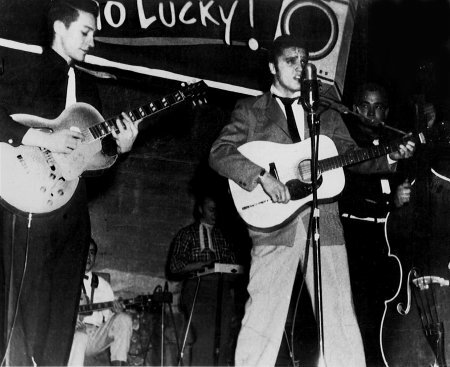 . . Elvis Presley, 19-year-old comer in the c.&w. 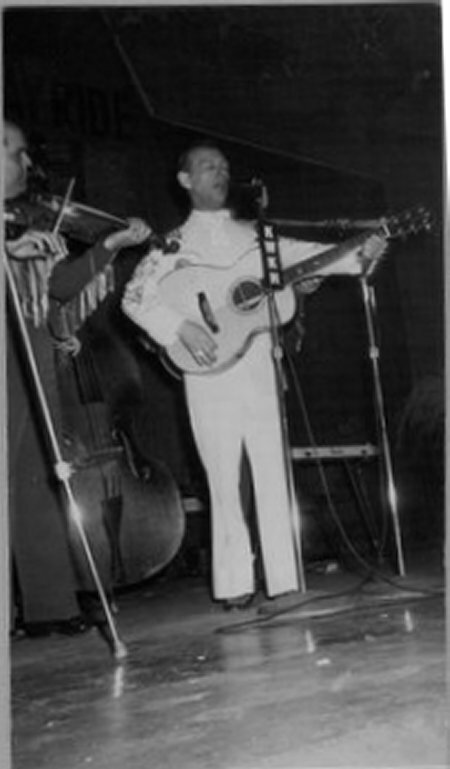 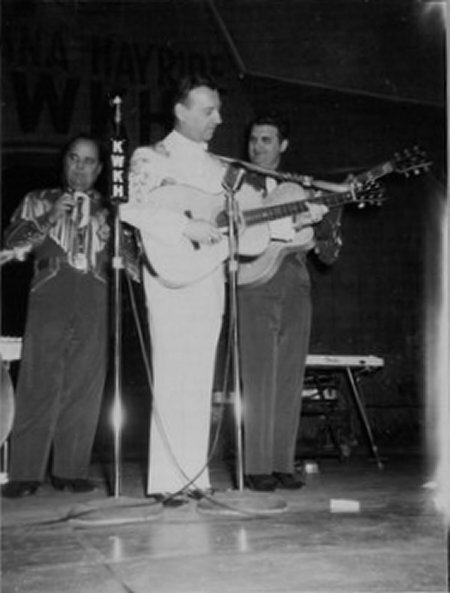 field, who guested on WWKH's "Louisian Hayride," October 16, and made such a hit that he was brought back a week later, has become a regular member of the "Hayride " forces, along with William Black and Winfred Moore (sic). 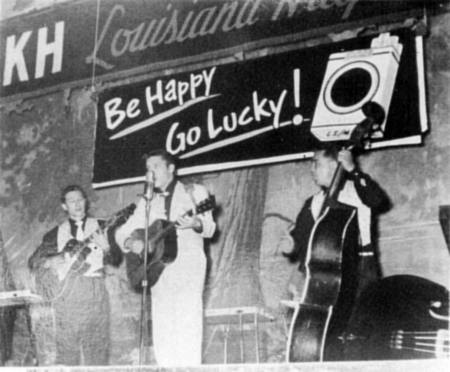 The three record for Sun Records.4 Things would soon change. 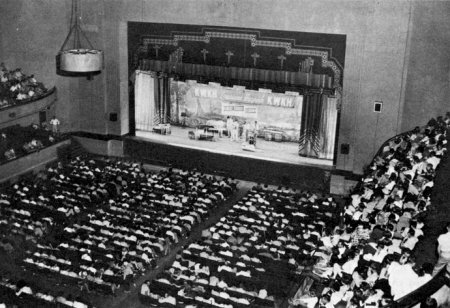 It wasn't long before the audiences got younger and louder. 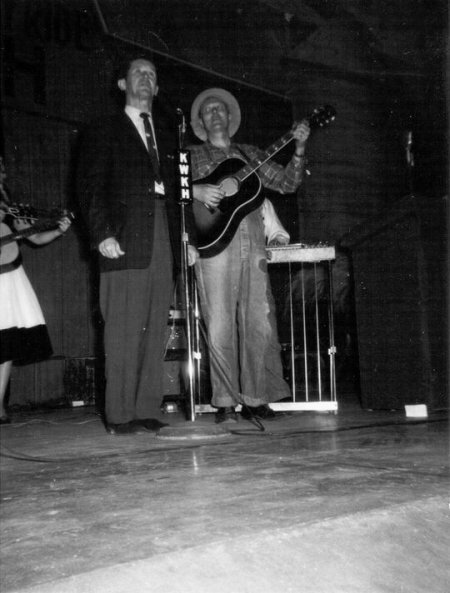 It was on the Hayride that they first met D.J. 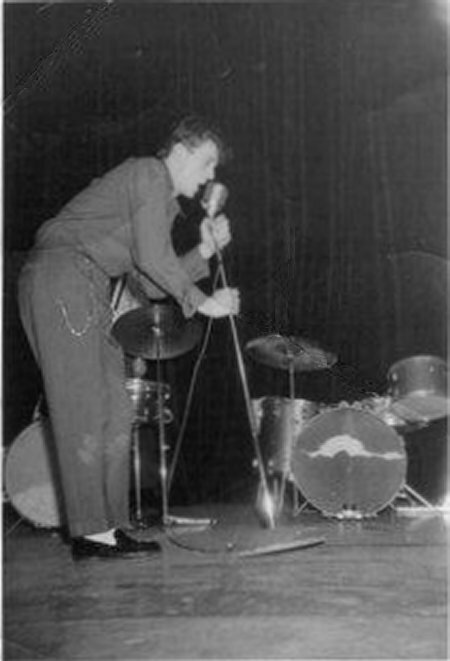 Fontana, the staff drummer who generally played behind the curtain. 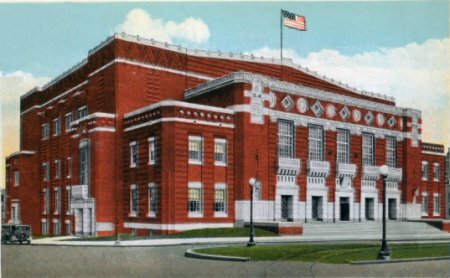 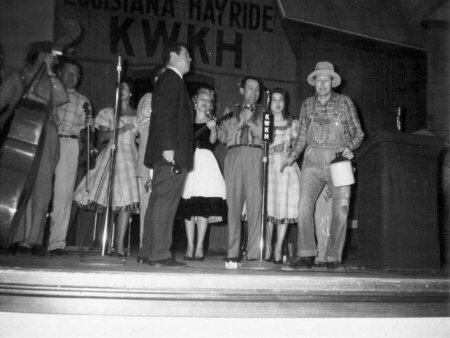 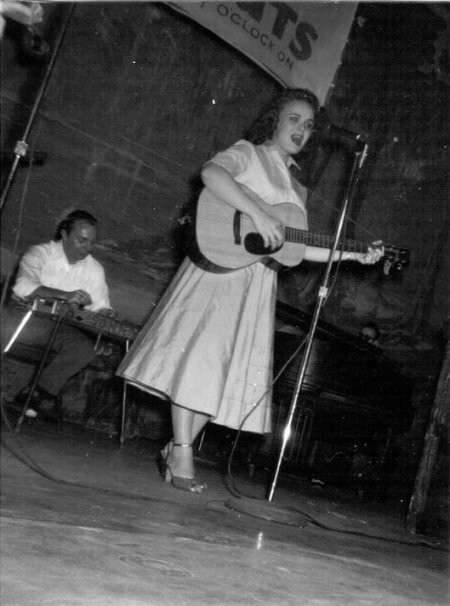 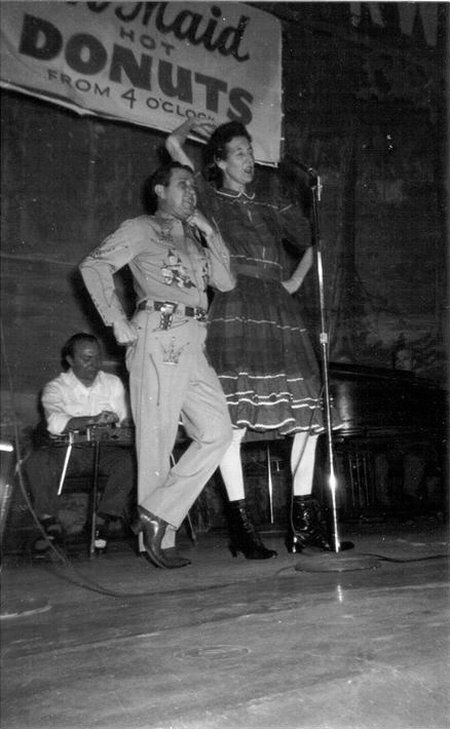 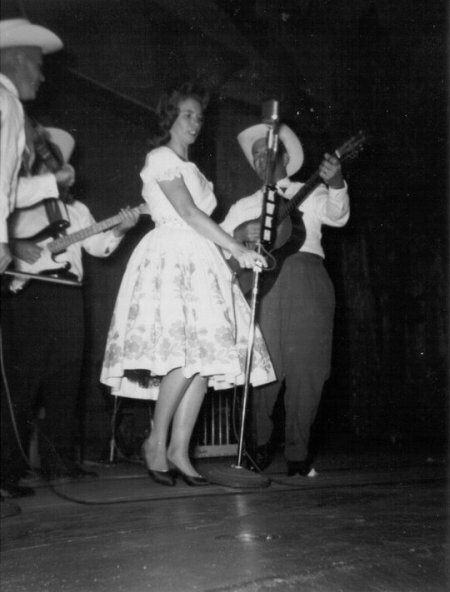 During their tenure they would often tour with other Hayride acts like Jim Ed and Maxine Brown, Betty Amos and others and also perform on the Hayride's remote broadcasts in other cities when other events occupied the Municipal Auditorium. 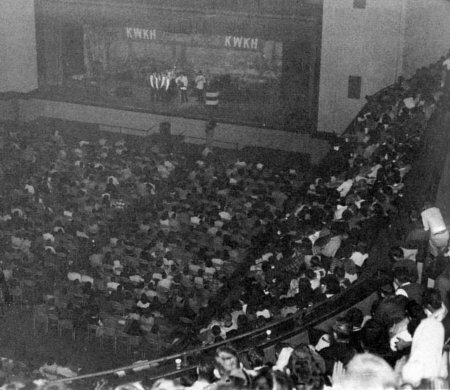 The Saturday night broadcasts of the Hayride eventually all but assured attendances in the venues they played within range. 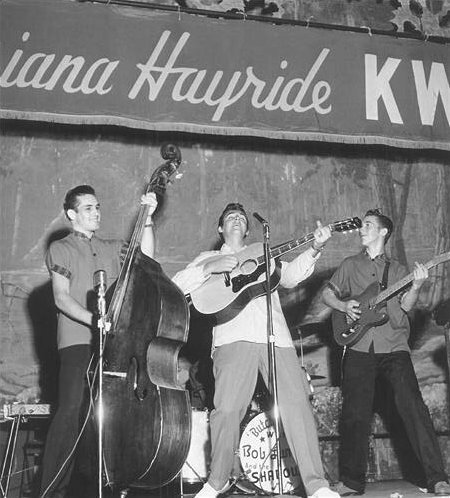 Scotty, Elvis and Bill at the Louisiana Hayride - fall 1955? 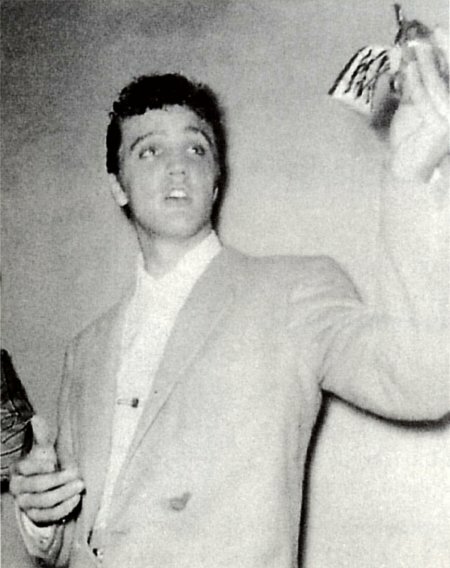 Elvis backstage of the Shreveport Municipal Auditorium with Horace Logan's pistol - Oct. 1955? 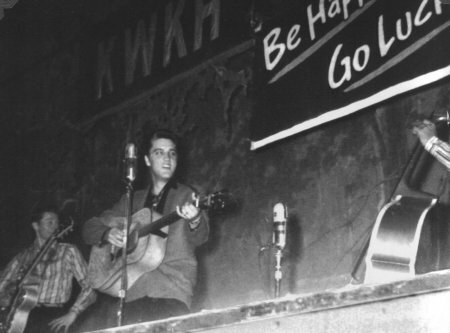 Around November of 1955, fellow Sun artist Johnny Cash made his debut on the Hayride while just months before George Jones had auditioned at a remote broadcast in Conroe, TX which led to his signing. 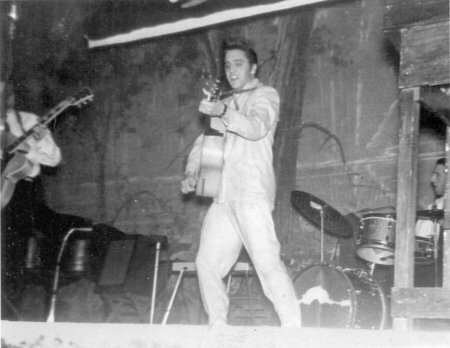 That November, much to the dismay of Colonel Parker, Elvis signed on for another year. 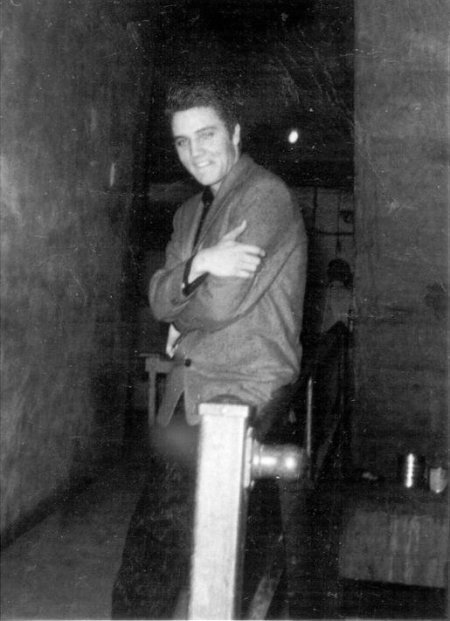 Johnny signed on as a regular in January. 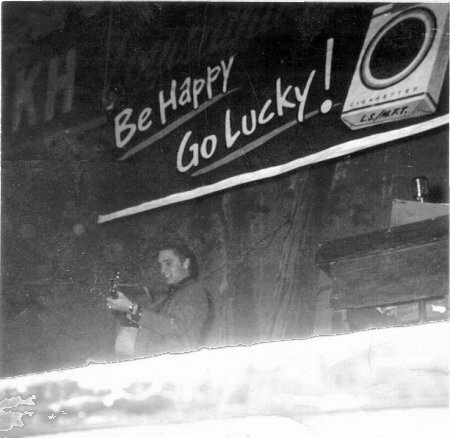 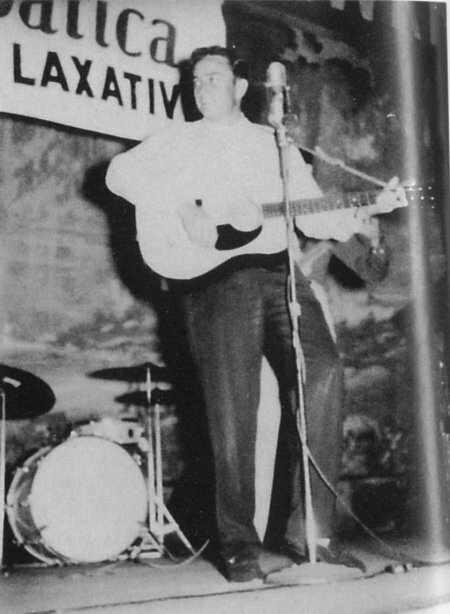 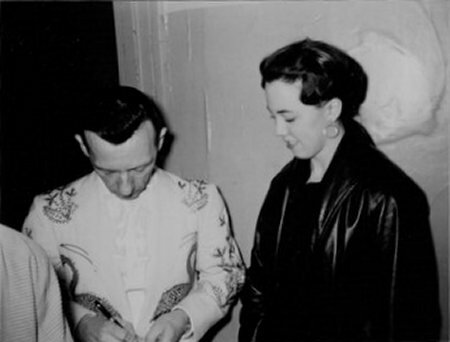 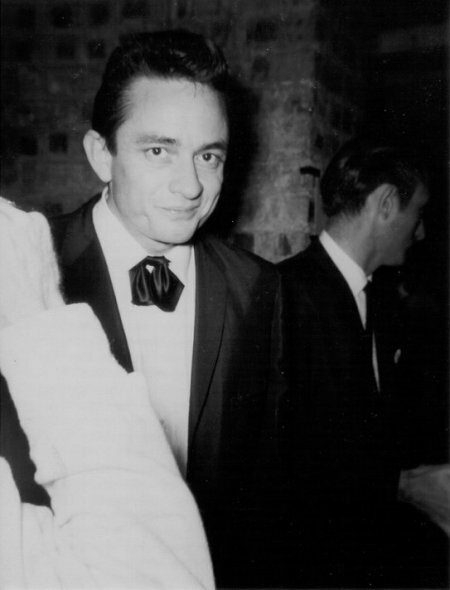 Johnny Cash at the Louisiana Hayride - Feb. 1956? 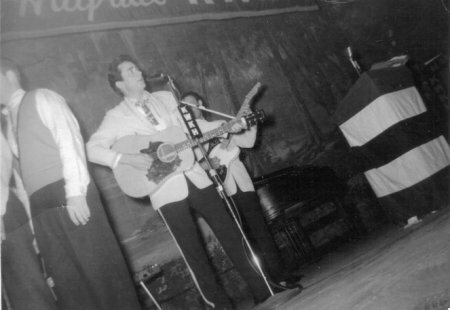 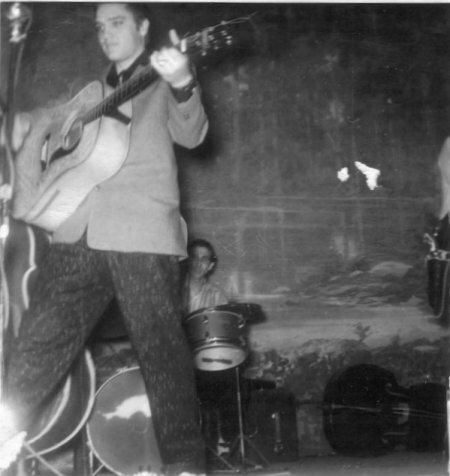 DJ, Elvis and Bill at the Louisiana Hayride - Feb. 1956? 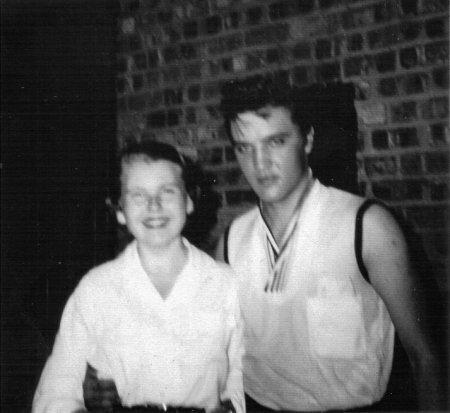 I 'bout died when he put his arm around me (14 years old). 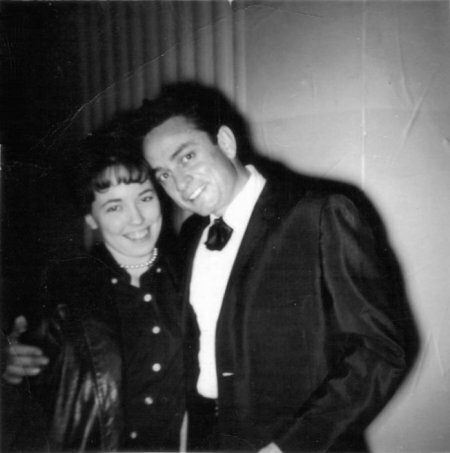 He'd just come off stage...pink and black shirt..had just removed his jacket...still sweaty, Carol said. 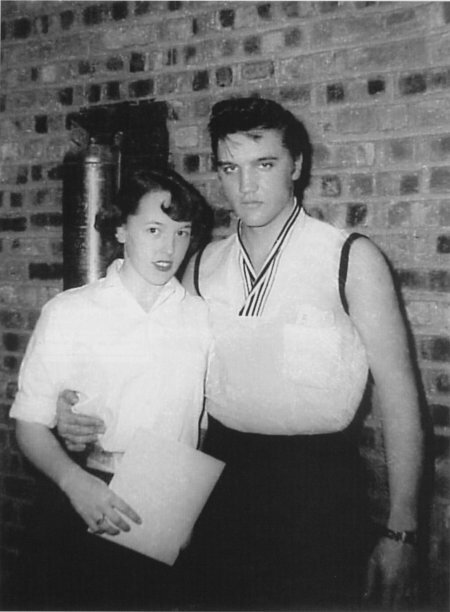 The person who took the pictures was the one who got us backstage to meet Elvis, and I don't remember who that was. 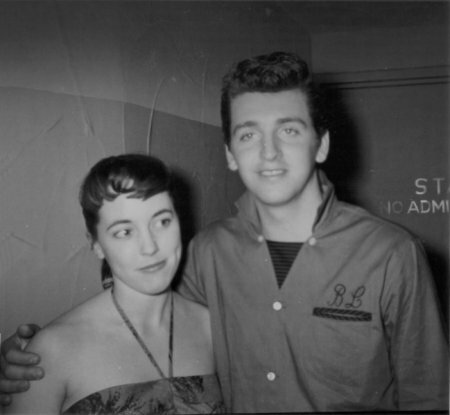 I had not met Guy yet, so it was March 10, 1956. 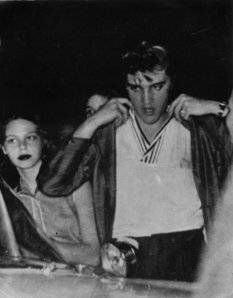 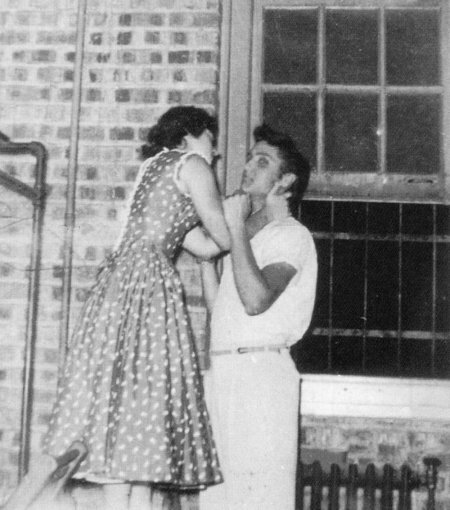 Elvis' shirt was pink and black and sweaty because he played his performance with the very same shirt and a jacket, Carol said. 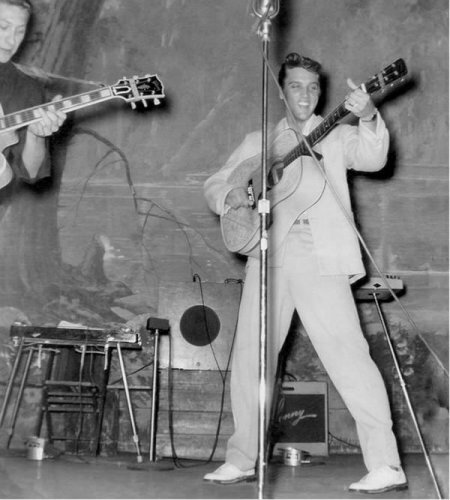 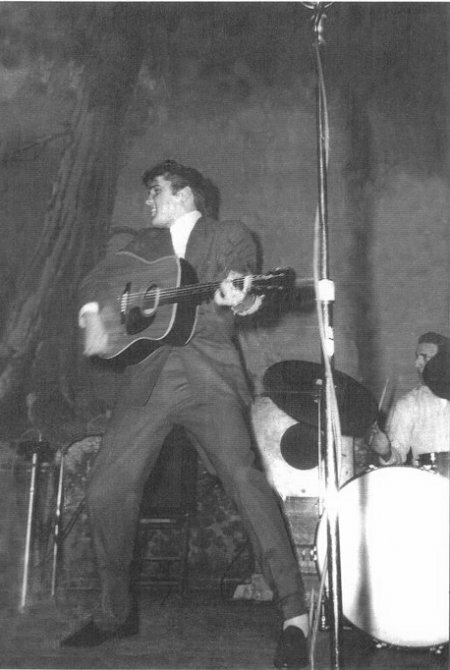 However, by March of 1956, due to his impending stardom, Elvis would buy out of the remainder of his contract for $10,000 and the agreement to return at a future date for one final benefit appearance. 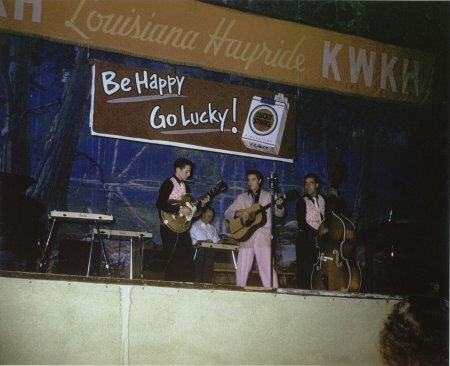 On March 31st, they gave the last of performance on the Hayride at the Auditorium and it almost seemed to mark the beginning of the end for the show. 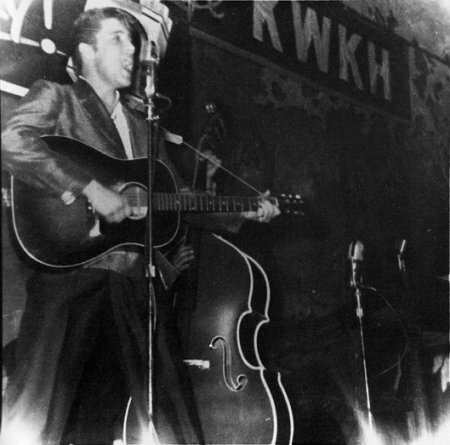 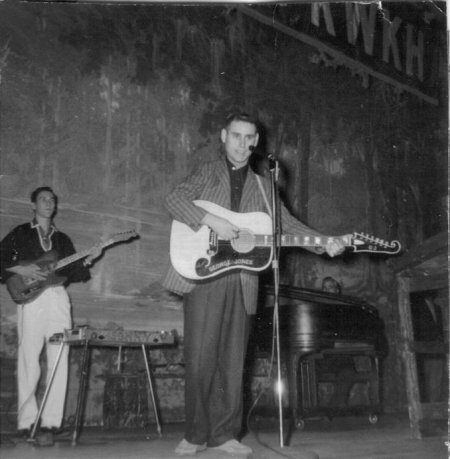 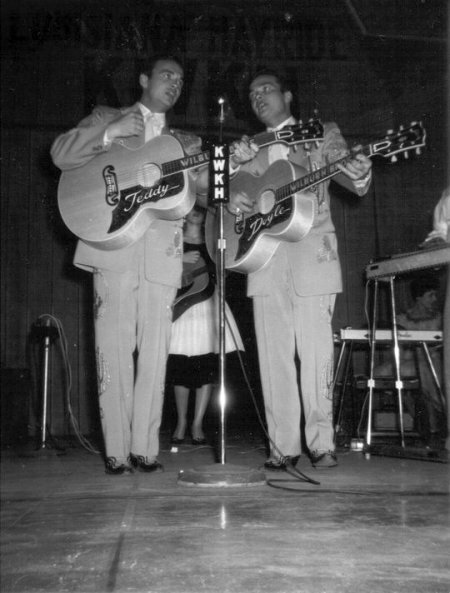 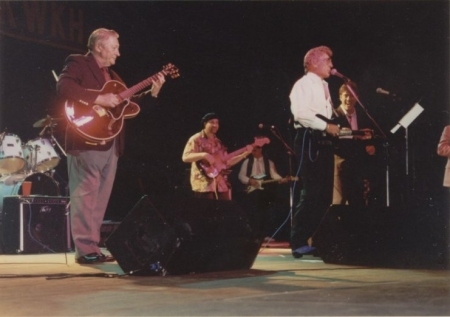 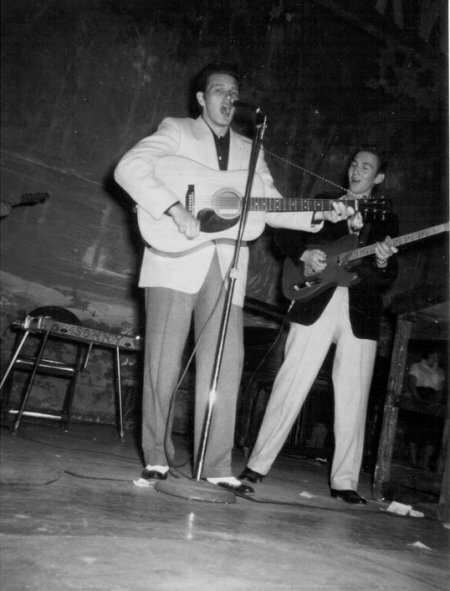 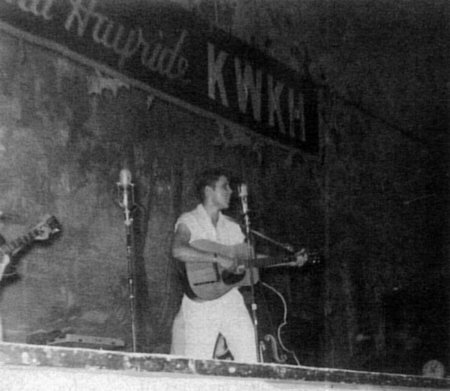 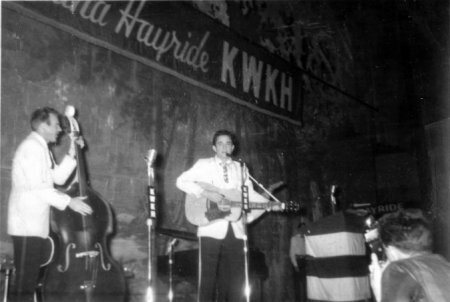 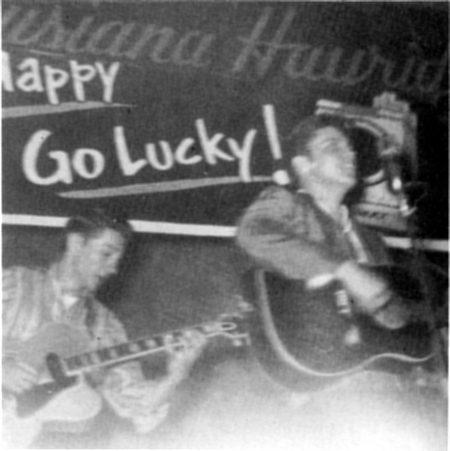 Both Johnny and George would move on to the Grand Ole Opry in the summer of 1956 but the Hayride though would see the development of other local talent that year. 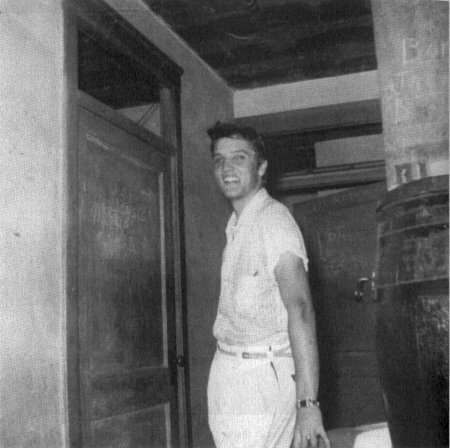 When Elvis entered the Army in 1958 the boys were left to fend for themselves. 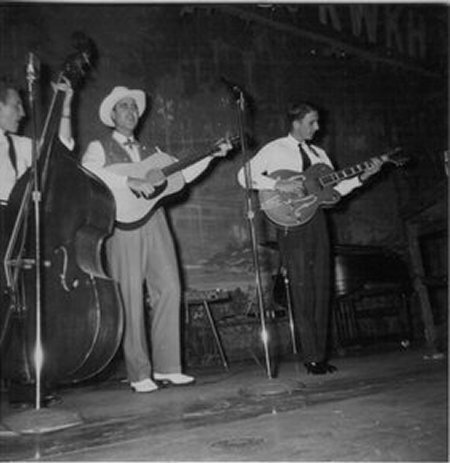 Bill would form the Bill Black Combo and Scotty would produce a hit, "Tragedy," with Thomas Wayne (Perkins), Luther's brother. 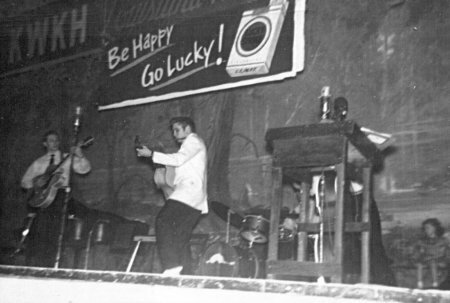 DJ, originally from Shreveport, would briefly perform with Gene Vincent and the Blue Caps. 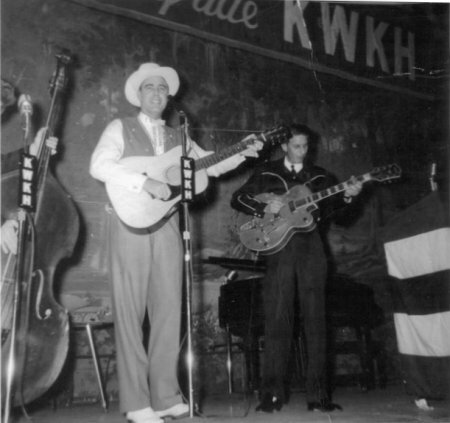 However, rhythm guitarist Max Lipscomb, aka Scotty McKay has said the band was a little too hell raising for DJ. 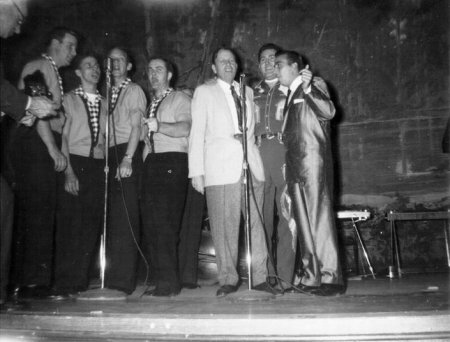 Music and Hayride historians have identified several factors which contributed to the Hayride’s decline and eventual end which include: the loss of the Hayride’s place on CBS’s national radio network by 1958, local disk jockeys playing recorded music replaced network programming and live musical broadcasts, competition from television’s free programming, rising production costs including talent fees and facility rentals, and also Shreveport’s lack of recording studios, booking agencies, and music publishing companies, i.e., related businesses needed to support the music industry. 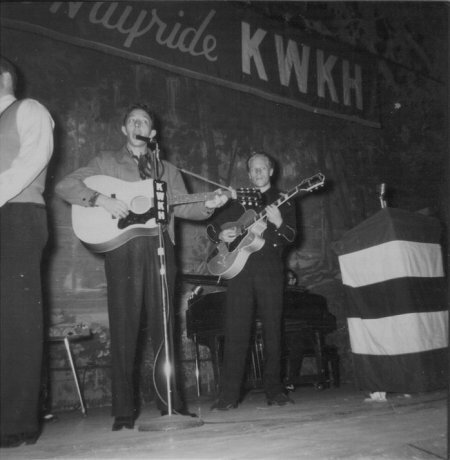 In it time though, the Hayride had introduced and/or nurtured the careers of at least twenty-three major country music stars now included in the Country Music Hall of Fame. 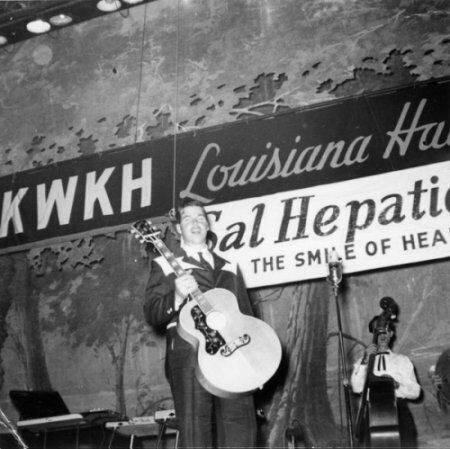 The show left a body of work including 550 Saturday night broadcasts of the best country music available at the time.2 Years later, compilations would be released of some of the finest performances recorded there by Elvis, Johnny and the others. 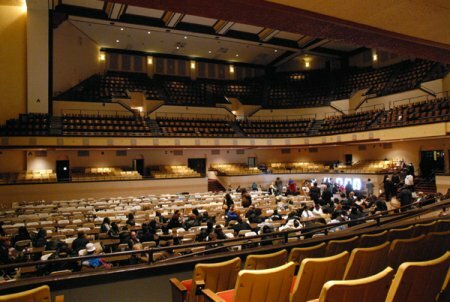 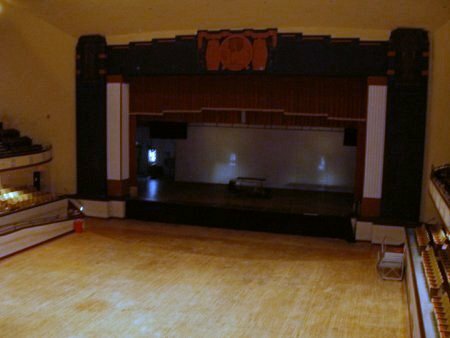 The Auditorium however would continue to see other major acts through the years. 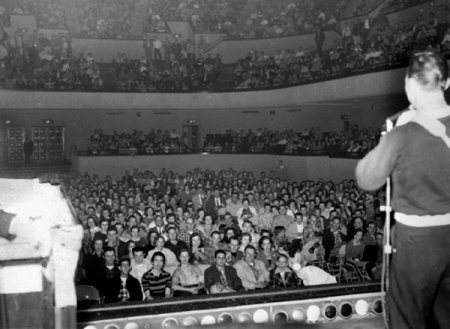 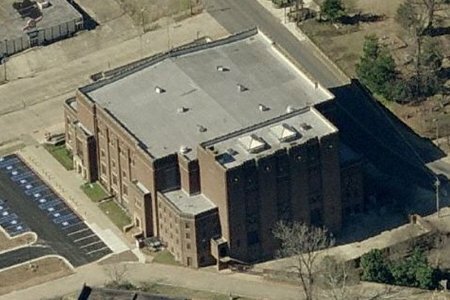 In October of 1960, Shreveport and the Auditorium were just one of the stops for General Artist Corporation's "Biggest Show of Stars for '60." 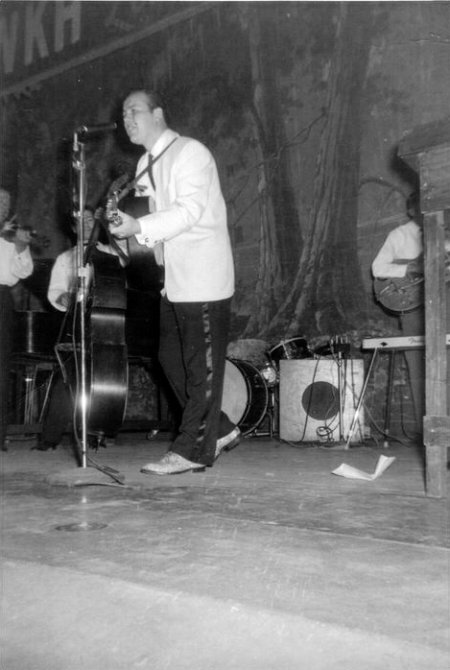 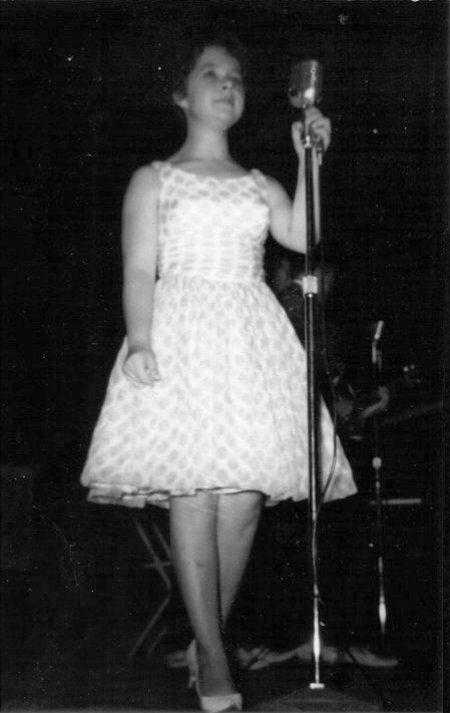 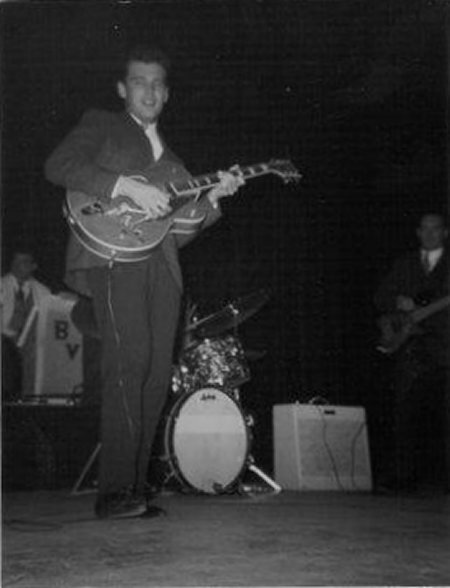 The show was headlined by Fabian, Duane Eddy and Brenda Lee backed by the Bobby Vincent Orchestra. 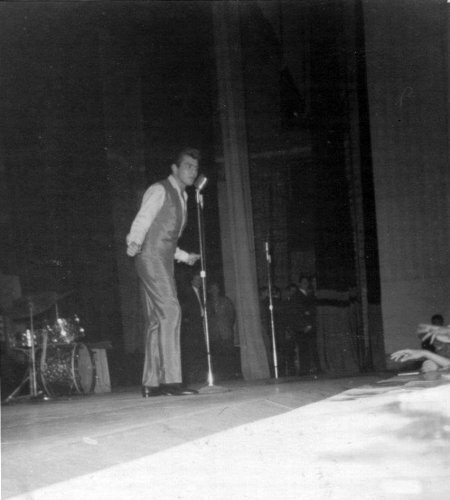 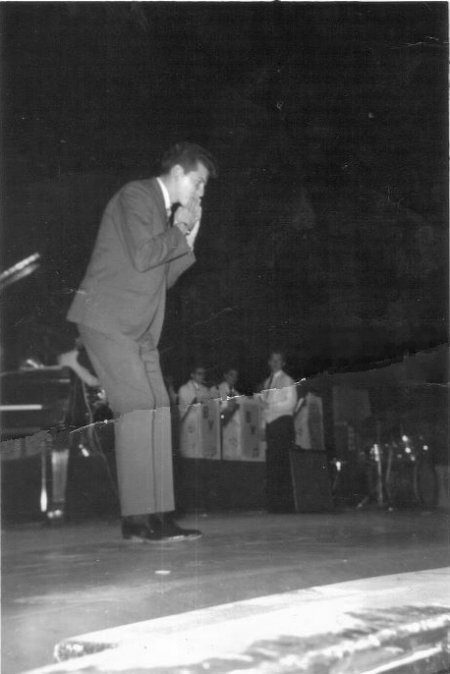 It also featured performances by Freddy Cannon, Garry Miles, Chubby Checker, Garry Miles and the Bill Black Combo. 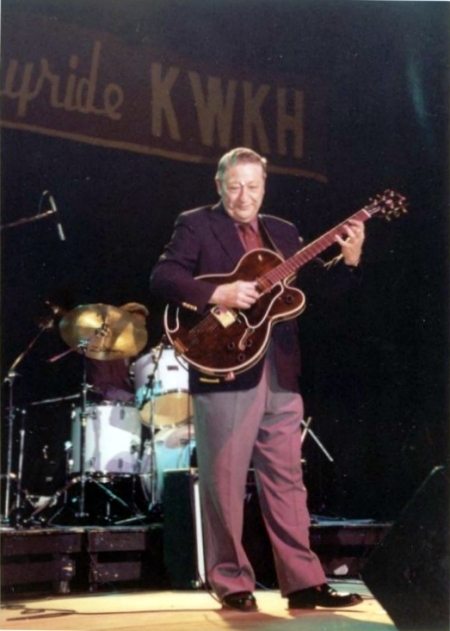 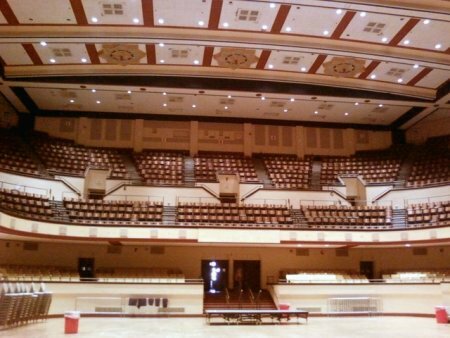 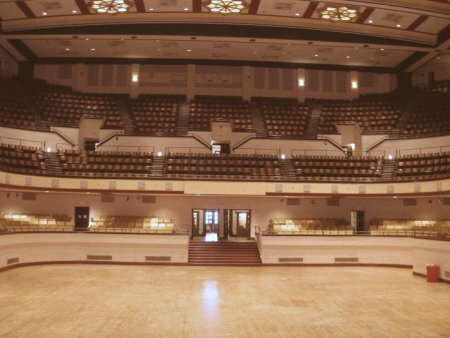 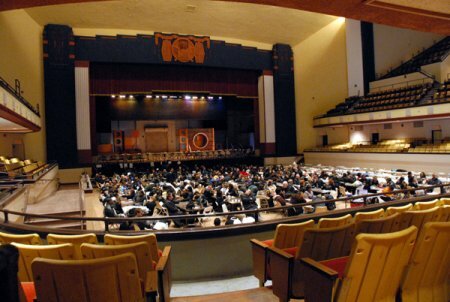 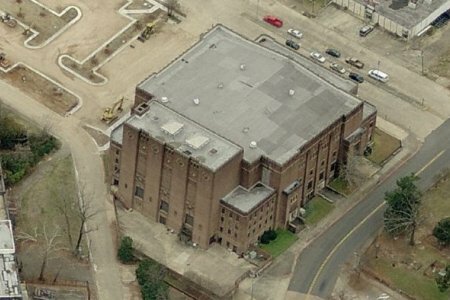 In 1991 the building was listed on the National Register of Historic Places.1 On October 16, 1994, forty years to the day since his first appearance on the Hayride with Elvis and Bill Black, Scotty returned to the Auditorium for a 40th Anniversary concert put on by Nashville International Concerts in association with Joey Kent, owner of the Louisiana Hayride Archives. 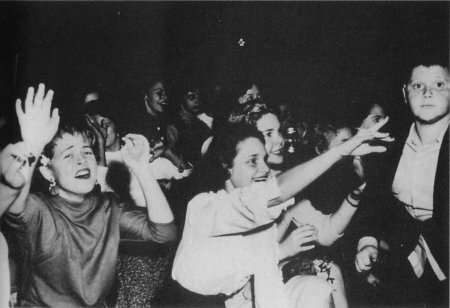 The show also featured D.J. 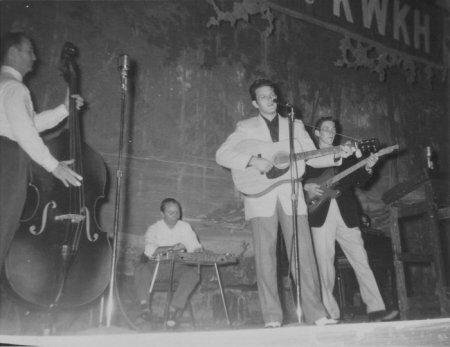 Fontana, Carl Perkins, The Jordanaires and Ronnie McDowell, all performing under the original banner. 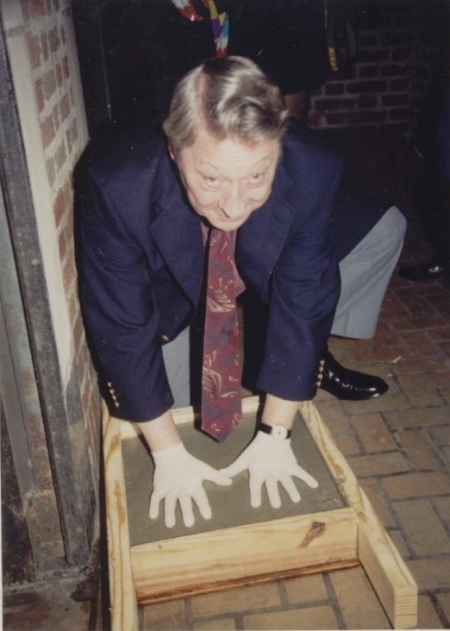 At that time, Scotty's handprints were cast in cement for a walkway. 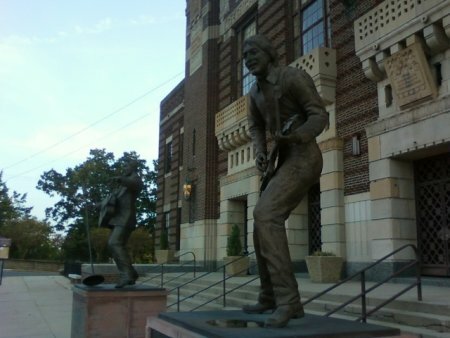 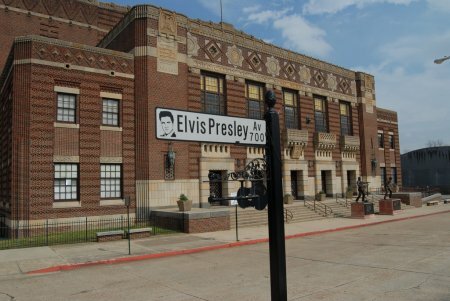 A statue of Elvis Presley was erected on the sidewalk in front of the Auditorium in October of 2004 to commemorate the 50th anniversary of his first appearance at the auditorium and Grand Avenue was renamed Elvis Presley Avenue.1 The following year, in August, a statue of James Burton was also installed on the sidewalk and for several years the auditorium hosted the James Burton International Guitar festival. 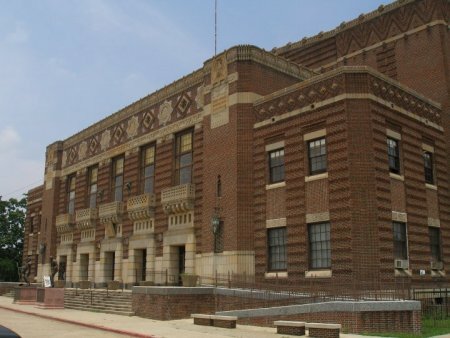 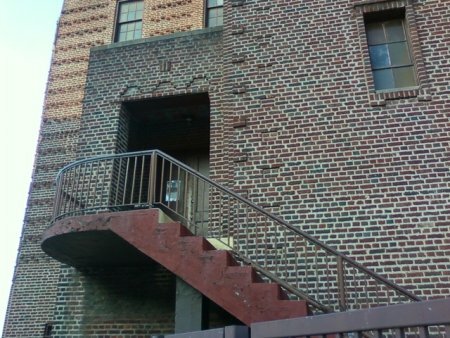 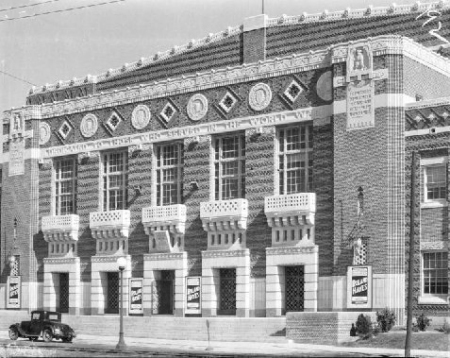 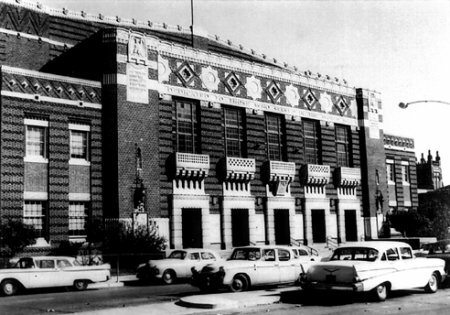 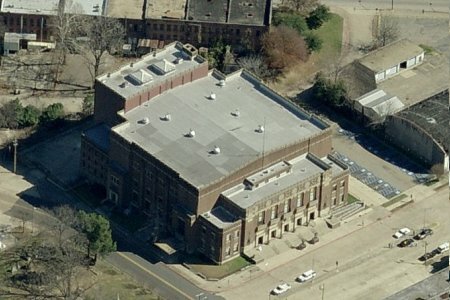 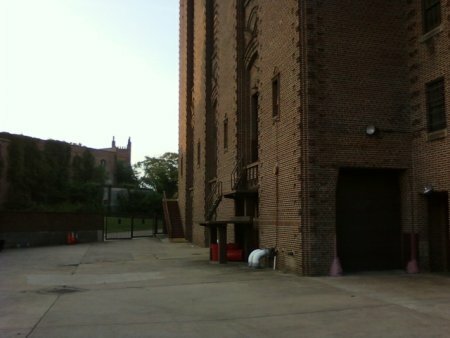 The building was designated a National Historic Landmark on October 6, 2008. 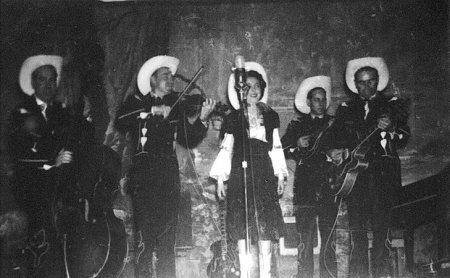 Special thanks to Ana Fernández Sangil for the excerpts from her interview, to the Golemons, John for the photos, Carol for her permission to use them and her and Guy for their input. 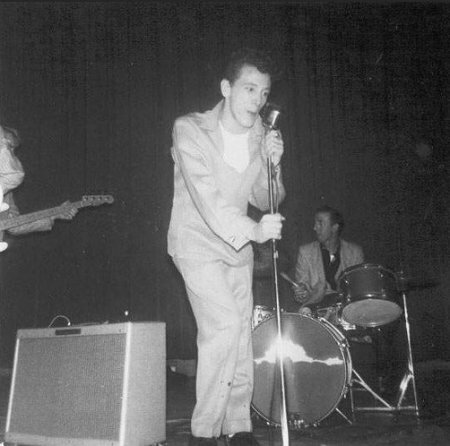 Thanks also to Rick Crofts and Joey Kent for their early assistance with this page. 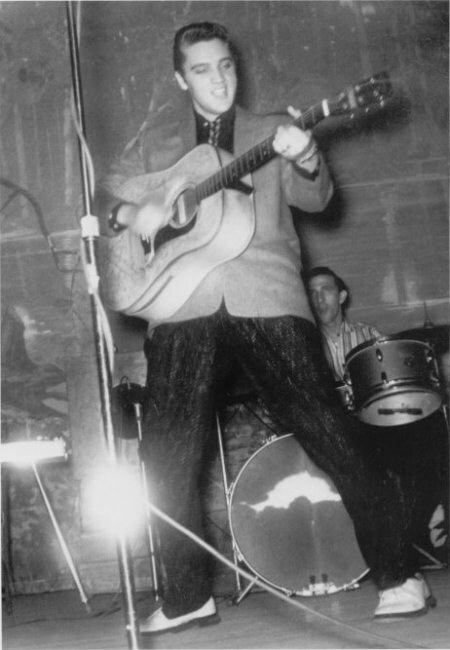 *Some dates speculative based on tours and artist appearances advertised in Billboard Magazine.